The pull of Scotland, the place of Donald’s birth, would prove strong and it was always his ambition to return to his ‘homeland’ to build a home for himself, Isabella and also as a legacy for future generations. Donald left Scotland as a man of potential and returned a man of substance. In 1894 Donald was involved in a land auction in Edinburgh and was successful in his purchase of a considerable amount of land in Glencoe; one of Scotland’s most famous glens. It was stated that he paid £13,330 for the 48,000 acre estate, which included slate mines, numerous farms and crofts as well as moorland. Not long after he purchased the estate, in 1895, he commissioned Sir Robert Rowand Anderson, Scotland’s premier architect of the era, to design a new house that would be the jewel in the crown of the estate. Donald’s instructions were that the house should commemorate his marriage and provide a Scottish base for future generations; as Donald was 75 years old when he commissioned the house, he anticipated the future use of the building by his daughter and her children. The house held a magnificent position and was to dominate the landscape as it was designed to make the most of the views to Loch Leven on one side and the Pap of Glencoe on the other. The house was built in local granite and dressed with red sandstone. In the external stone work, expert stonemasons carved numerous symbols into the stone. 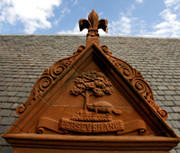 For example, Donald’s crest of a Beaver gnawing at the base of a maple tree was fashioned into the stone along with his motto of ‘Perseverance’. Donald and Isabella’s initials, DAS and ISS (sometimes JSS in Latin) were also carved above some of the windows; the initials were separate and demonstrated that she was an individual in her own right and not merely an extension of her husband, which again underlines the strength of Isabella’s character. The internal features of the building continued the theme of Donald and Isabella’s marriage. The ceilings were a particular feature with intricate plaster work comprising thistles, fleurs-de-lis, roses, maple leaves and oak leaves, which were to symbolise the Scottish, English and Canadian heritage of their grand children. There is no doubt that it was built to impress with the elaborate plasterwork, wood carving and a white marble staircase. No expense was spared in the construction of the building and its interior is a testimony to the skilled craftsmen of the era. It was reported to have cost in excess of £30,000 to build. Nonetheless, it is still difficult to overlook the original premise of the building. In reality the couple were to spend 4-6 weeks a year at Glencoe House with Donald’s work tying him to London. Glencoe House was to host numerous family gatherings though. This can be seen in Gwendolen Marjorie Howard’s photographs in 1905, and are courtesy of the Osler Library, McGill University, Montreal, Canada. Gwendolen was sister in law to Margaret Charlotte Smith (Donald and Isabella’s daughter).